"What is a Rain Sensor?" Of course, now with everyone having a Smart Phone. Our business "NOW "offers WiFi Irrigation Controller C apability ﻿﻿ ! You read correctly! You can now have the power to control your irrigation system in the palm of your hand. John Hart's Irrigation also offers Monthly, Two Month, and Three Month Irrigation Check-Ups . Next time you call and schedule for your irrigation needs; feel free to talk to our technician while he is there and ask him how often your lawn should be checked. Our technician will be able to recommend which check-up your lawn would require as well as the Check-Up Charge. When you receive your invoice you will also find a Check-Up Contract to look over. Before you decide to sign and begin your irrigation check-ups please feel free to call the office and speak to Angela with any questions you may have. Our company doesn't favor one Brand from the next. We simply use the Brand that produces the best performance currently on the market. However, if the customer does have a preference for a particular Brand we will accommodate. Although please understand that some products can't be used with certain systems; the technician would be able to explain to you why in detail. We do encourage you to ask questions; even if you think it to be a silly one. We are here to help you understand your system in every way we can. On that note, understanding your system.........A suggestion to anyone who has an irrigation system. Do you have a Rain Sensor ? This device will help from over watering your lawn. If there is rain this will shut down your system. Not only will you not have to worry about your system running during a rain, but there also won't be a worry of getting a fine. Rain Sensors are mandatory in Florida . In addition to this, systems may only run two days a week Before 10a.m. or After 4p.m. 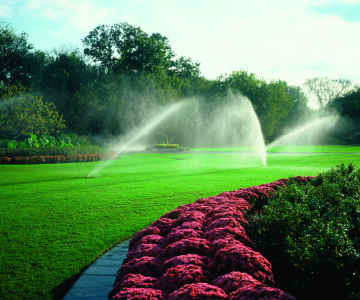 If you have any questions regarding watering days please "Click On" our WATERING RULES tab. Lastly, We offer Free Estimates for New Systems and System Expansions. As for Pumps and Irrigation Controllers; we do not Install these particular products until it is discussed with the customer. Discussion with Customer will consist of the estimated cost of product or work to be complete as well as consent to procede with the work agreed between the technician and customer. All of JHI's Timers, Pumps, and New Systems in which we Install come with a One Year Warranty.